The temps have finally dropped to winter-like feels in Texas and my hands are the first to tell me so! Even though I do my best to remember to wear gloves or mittens and as much as I moisturize my hands in the winter time, they manage to get dry and my cuticles become bothersome. First thing's first - it's important to care for your cuticles. In my opinion, when your cuticles are pretty, your manicure is nothing short of looking fabulous! Never cut, chew, or pick at your cuticles - they are there to protect your fingers from bacteria, fungus, and all of those yucky stuff! Use a cuticle cream to soften your cuticles before you use a cuticle pusher. Use the cuticle pusher in short strokes to clear the dead skin off your nail bed and then use the same tool to gently push back the live skin at the base of your nail. Occasionally, I'll get a pesky little hangnail and as much as I want to simply rip away the dead skin (and then deal with the horrible pain for days afterwards for doing that!) you should not do that! Instead, use a cuticle trimmer to trim away the hangnail. Wash and dry your hands (and sanitize your tools before you store them away) before you proceed on to doing the rest of your manicure. Hand lotions/creams are a bit different from your regular body lotion/moisturizer. Hand creams are a bit thicker in consistency than moisturizers for your face or body. I keep a hand cream almost everywhere in my home - vanity, nightstand, office desk, kitchen, bathroom. A travel-sized hand cream is perfect to keep in your purse! Currently in my purse, I am using Amande Delicious Hands Cream by L'Occitane. It's enriched with almond milk and almond oil - such a soft-smooth cream! I love the subtle scent of almonds. 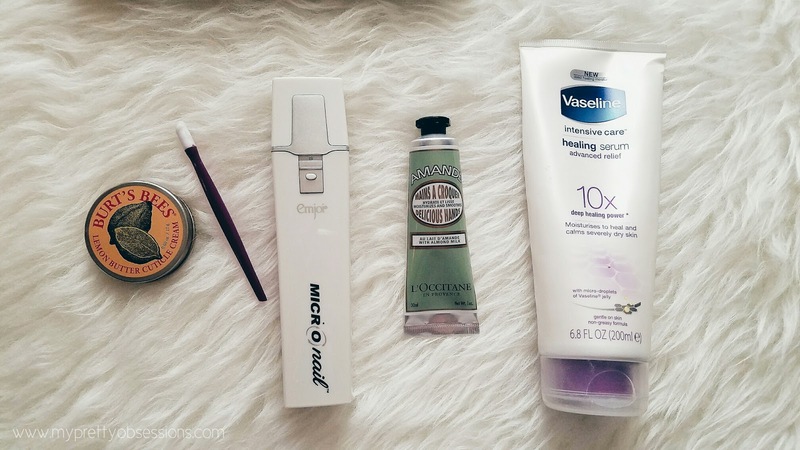 This hand cream keeps my hands nourished and soft all day long! On my nightstand, I've been committed to using Vaseline Intensive Care Healing Serum. It's inexpensive and you can find this at your local drugstore! The lavender scent is amazing! If you're sensitive to products with scents, this serum may not be for you. However, the benefits outweighs that - it absorbs fast and restores the softness of my hands overnight. I can't keep my nails long like I want to so I've been making sure to keep them short and clean. Nail polish is the very last step in my routine. First I clip, file, and buff (using my Emjoi Micro-Nail). 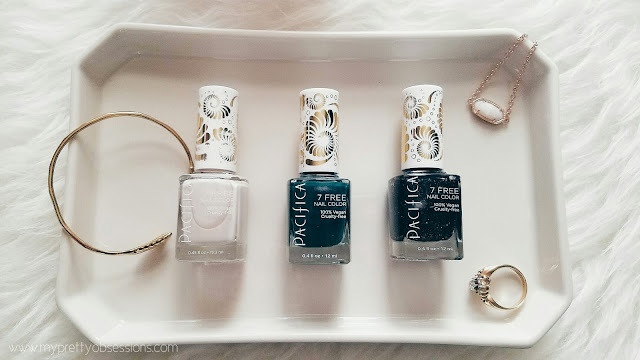 This winter, the 7 Free Nail Colors by Pacifica Beauty in Wonderland, London Tomboy, and Luxe Interior are my go-to manicure colors! You can find Pacifica's 7 Free Nail Colors at you nearest Ulta Beauty store! I need a few of these manicure items because I took my false nails off recently and trying to get them back in shape!